My fashion sense comes in for great mockery. While on holiday last year with a number of friends and their young children, it became quickly clear that my summer wardrobe was identical to that of a friend's two year-old son. My more formal and non-tropical taste was recently described in the Guardian as "Top Gear wrap party". I have written here numerous times about the sheer awesomeness of Paisley (the design, not the Reverend), and how I have waited, and waited since the 1990's for it to slowly come back in fashion. And it has. Slowly. First with ties then in the last year or two we have seen a full-blown Paisley eruption in shirts. One purveyor of such shirts that I admit a weakness for is Mr Ted Baker. When I first emerged from hospital after shedding 20% of my bodyweight in a freak being-fed-through-a-tube-for-a-month incident, I thought, "Poo, now I have to buy all new clothes. Everything. Poo", and one of the first places I wandered in to was Mr Baker's emporium in Dublin, and I said, "hmm, nice shirts". I bought a few and then, as my body slowly returned over the next year or two to something approaching a state of equilibrium, if not quite my pre-illness size, I ended up growing out of them, buying more, then grew out of them, then bought some more, and thus my closet is actually full of shirts that I will hopefully never shrink back into, but if illness takes me again at least I will still look acceptable. Anyway, I was wandering through Mr Baker's Covent Garden location today, looking longingly through the items marked 'Sale', when a helpful assistant said, "Would you like to meet the man himself", and I said, "Mr Baker? ", and he said, "The big guy, he's just come in, would you like to say hello? He always likes talking to customers". I didn't hear that last bit as I was already on the other side of the shop, my body controlled by parts of my brain normally only active in teen girls around boybandy idols. Mr Baker saw me coming, and opened up his arms and gave me a big hug. This is not a joke. Before I had even introduced myself he had his arms open and gave me a giant hug. We had a quick chat, I thanked him for his work in bringing back Paisley, he was glad I liked his designs, and then off he went laughing and joking around with the staff. 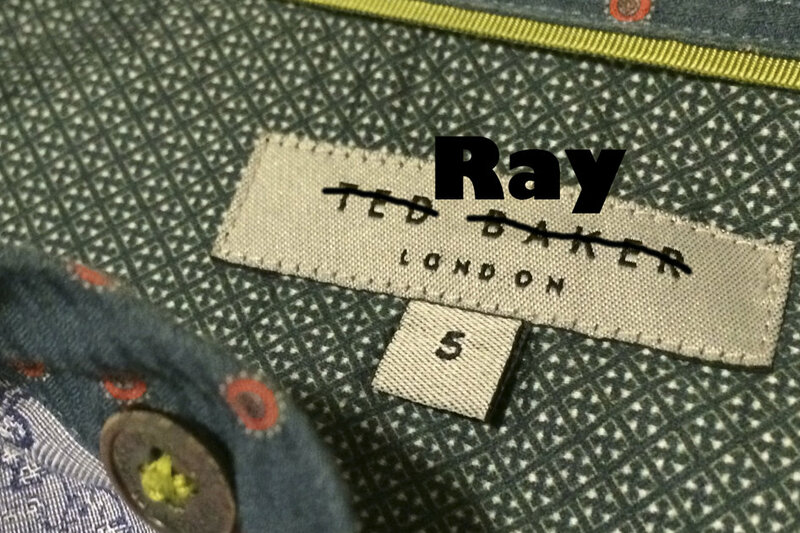 Of course he's not really Mr Baker, for Ted Baker is just a brand. But he was Ray Kelvin, founder and CEO of the label and, to be honest, he was genuinely a nice guy. Seriously, he hugged me. Twice. Who does that? And yes, I'm a militant lefty who likes nice shirts. Don't label me, bro.